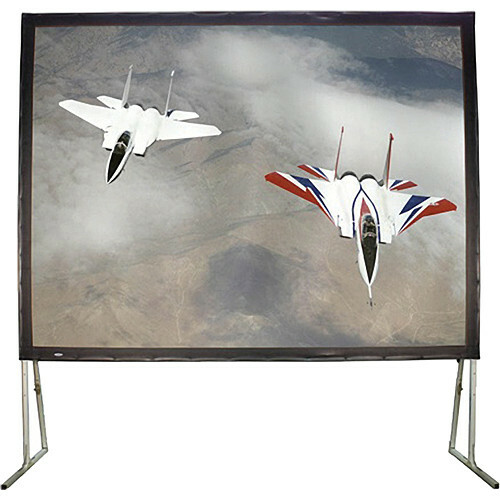 The 96 x 120" Easy Fold Portable Projection Screen from Buhl is a large framed screen perfect for anyone who travels much of the time and needs a portable screen that sets up rapidly and collapses with minimal effort. The sturdy aluminum frame is supported by two reinforced legs and can be set up in a matter of minutes with no extra tools required. The matte white screen surface is designed for front projection and delivers a clear, crisp and easily viewable image. The frame assembles via rapid locking joints that feature quick-release mechanisms. The Easy Fold comes with its own hard-shelled wheeled travel case that is secured with recessed butterfly latches. Recessed pull handles make it easy to navigate through parking lots or up and down ramps. Backed by Buhl's one-year warranty, the Easy Fold Portable Projection Screen can save you time and money for all your audio-visual presentations. This screen will eliminate your having to rent a screen each time you travel to a presentation. Whether for education or business, this screen can solve your on-site A/V problems. Box Dimensions (LxWxH) 49.6 x 24.6 x 15.0"